Nicolai Bornand was rated the nation’s No. 16 kicking prospect by ESPN.com his senior year at Dos Pueblos High School in Santa Barbara, Calif. But when it came time to pick a college, the former Channel League Defensive MVP picked UNLV because the Rebels promised him the chance to play linebacker. 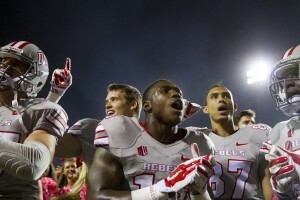 The 6-foot-1, 230-pound sophomore has yet to make an impact on defense for UNLV during his career but Friday night he made two of the biggest plays of the season for the Rebels in a 30-27 upset of Fresno State at Sam Boyd Stadium. Bornand connected on a 47-yard field goal late in the fourth quarter to tie the game at 27-27, then booted the game-winner from 33-yards in overtime as UNLV (2-5, 1-2) defeated an FBS team for the first time since last November. Not just any FBS team, mind you. But the defending Mountain West Conference champion Bulldogs (3-4, 2-1), who entered the game all alone in first place in the West Division and had beaten the Rebels 10 straight times dating back to 1984 when Randall Cunningham was quarterbacking UNLV. 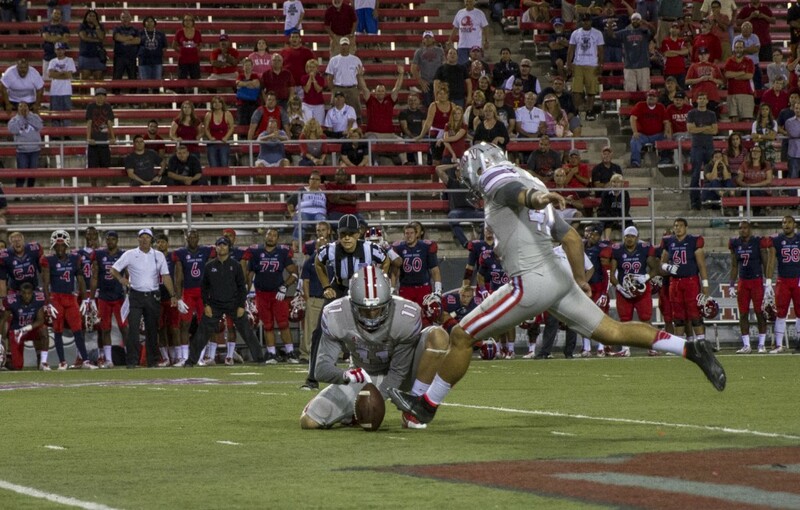 Bornand got the chance because UNLV’s normal short-yardage field goal kicker, Jonathan Leiva, pushed a potential game-winning 26-yarder right at the end of regulation. Fresno State, which trailed 17-0 at halftime, had rallied to take a 27-24 lead on a 13-yard touchdown run by Marteze Waller with 7:21 remaining but its placekicker, Kody Kroening, missed what turned out to be a very key PAT that would have put the Bulldogs up by four. The Bulldogs also blew another chance to seal the win before Bornand’s 46-yarder when safety Derron Smith, the Mountain West’s preseason defensive player of the year, dropped an interception at midfield. UNLV won the toss and elected to play defense first in overtime. The Bulldogs, plagued by kicking woes themselves during the season that even forced head coach Tim DeRuyter to hold on-campus auditions for walk-on placekicking candidates, decided to go for it on 4th-and-3 at the 18 instead of settling for a field goal try. But quarterback Brian Burrell, under pressure from a strong Rebel pass rush, barely overthrew an open Waller in the end zone. That meant UNLV just needed to kick a field goal on its ensuing possession to win it. The Rebels drove to the 16 where Bornand, after a Bulldogs’ timeout to “freeze him”, drilled the game-winner. The Rebels got big games offensively from quarterback Blake Decker, who completed 29-of-40 passes for 332 yards and a touchdown and also rushed for 40 yards and another score, wide receiver Devonte Boyd, who caught seven passes for 77 yards, and running back Keith Whitely, who finished with 87 yards on 18 carries. The good news is that the Rebels get some time to enjoy it. UNLV has a bye next weekend before heading north to face defending Mountain Division champion Utah State on Oct. 25. Steve Guiremand was born in southern California and graduated from the University of Southern California in 1978. He has covered college and professional sports as well as recruiting for over 30 years for several publications including the Los Angeles Herald-Examiner, The National Sports Daily, the Long Beach Press-Telegram and the Las Vegas Sun. He moved to Las Vegas in 1998 and has covered UNLV football and basketball as well as the old Las Vegas Stars triple-A baseball team. He’ll blog about UNLV sports and recruiting.